Meet the Etch-A-Snap, the Frankenstein'd creation of self-taught programmer Martin Fitzpatrick. 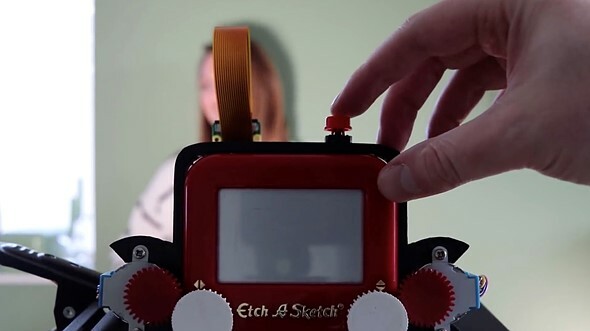 As the name alludes to this creation is the result of mashing together a Pocket Etch-A-Sketch, a Raspberry Pi Zero, and onboard camera module, a couple servo motors and a number of other goodies to create what is 'probably' the world's first Etch-A-Sketch camera. The photos captured with the onboard camera are shrunk down to a 240x144 pixel image and converted to a 1-bit black and white color palette. Once processed, the resulting image is then processed and subsequently converted into plotter commands. Those commands, which look a bit like an Etch-A-Sketch drawing on their own, are then converted into an analog Etch-A-Sketch image through two 5 v stepper motors that are mounted into a custom 3D printed frame. The Etch-A-Snap is powered by four 'AA' batteries and three 18650 LiPo cells, making it a self-contained unit that can be carried around (although not easily, based on the looks of it). According to Fitzpatrick, it can take anywhere from 15 minutes to one hour to create a sketch, depending on the complexity of the photo. He says the device now runs at 20 pixels per second, a dramatic improvement over the two pixels per second it was running at in earlier tests. In addition to the above clips, Fitzpatrick has also shared a number of photos and videos on Two Bit Arcade explaining the process. If you're feeling brave, he's also provided all of the materials and assets he used to create the device at the bottom of the post. It isn't for the faint of heart though from the looks of it, not to mention you'll need access to a 3D printer. LowePro need to make a bag for it. 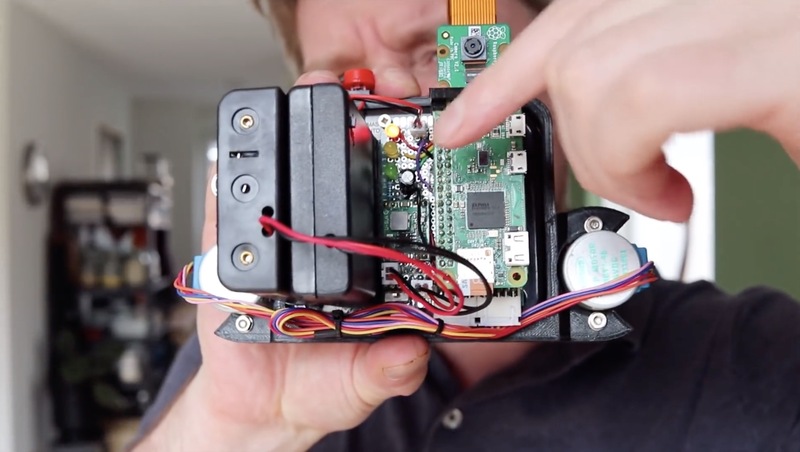 As a photographer and someone who also dabbles with Raspberry Pi's I can appreciate the effort that has gone into this. Some manufacturers will incorporate this feature in some of their cameras. Take a picture, and see the sketch happen on the LCD monitor. Super fun and clever. Thanks! Next project: robotic Lego construction from a photograph. Years ago, I had a photo editing program with an Etch-a-Sketch setting. If this guy is selling the product he's likely going to be getting a letter from some attorneys. Very clever! Would love to see this on a full-frame etch-a-sketch! This is awesome on so many levels! (One level being how sideways this comment thread will go when Canon and Sony fanboys show up to complain about the colors). Sort of reminds me of my bitcam app that takes original Mac resolution B&W pictures (or Color Mac pictures). Very, very, very clever, Martin. Engineers, in particular, know the complexity and the effort you have put in this fun project. I too have had the Raspberry Pi-Zero for quite a while, but I don't, and may never have your patience. Please be careful with the three 18650s, they have plenty of juice, and can do some serious damage. Some things are not made for commercial purposes, but to show the power of ingenuity. Good job, man! Interesting and cool stuff. Low dynamic range, no menus, and no card slots? Still more valid than those overpriced, pre-exposed rolls of "creative" film. as always : what about 4K and dual card ? I'm patiently awaiting the full review.. Such a glorious waste of time, love it! This is cool and fun! Sharpness is certainly impressive, the dynamic range is a bit lacking however. Plus it captures every single bit you put into it! Wonderfully silly. I love it! Nice hack. About six years ago I wrote a little program to convert grayscale images into continuous line drawings (as G code) suitable to be printed on a 3D printer. It uses a modified Hilbert curve to approximate the gray shades. Let me know if you'd care to try that algorithm... I'd have to dig around a bit to find the code because I haven't used it for at least four years; the resulting images look great, but were too fragile as 3D prints. I would love it if he contacted you and integrated that algorithm. What he's done so far is super clever and unique but the translation to line art is severely lacking. We need DXOMark rating for this camera. The resolution in the corners is surprisingly sharp, and there is a noticeable lack of barrel distortion, coma, or any chromatic aberration that I can tell. Bokeh is lacking, but I guess you have to compromise somewhere. I dunno about this -- seems kinda sketchy. Chalk one up for Canon R&D. Finally, something for all the Resolution and Dynamic Range haters. This device is not for haters because haters are not cool. This device requires to be cool and not in a hurry. Now I understand what computational photography is all about! The future is here. So, he created a Raspberry, uh? Canon should take note of the DR offered by this new camera. Well, you could say that about B&W photography too. I love it. Thank you, Mr. Fitzpatrick, for making it and showing it to us.